A Twitterbot is a type of bot software that controls a Twitter account via the Twitter API (Application Programming Interface). 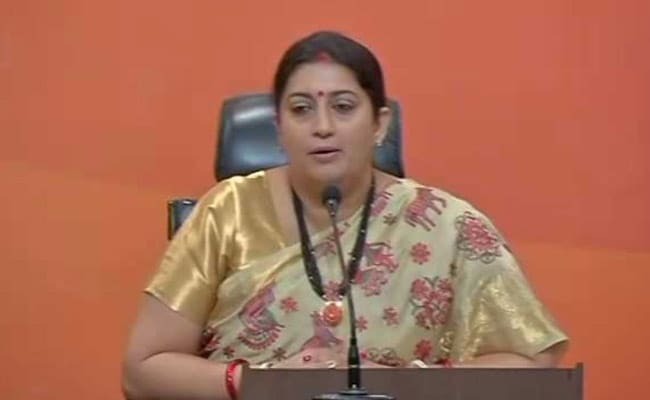 New Delhi: Information and Broadcasting Minister Smriti Irani on Saturday took a jibe at Congress Vice President Rahul Gandhi over the rise in the number of people retweeting his messages and sought to link this with twitter accounts in Russia, Indonesia and Kazakhstan. Congress however rejected the allegation as "factually wrong". Ms Irani attached with her tweet a news report, "Bots behind rise in Rahul Gandhi's twitter popularity? ", which said that a glance at the twitter handles retweeting Gandhi's tweets does throw up some questions. A Twitterbot is a type of bot software that controls a Twitter account via the Twitter API (Application Programming Interface). The bot software may autonomously perform actions such as tweeting, retweeting, liking, following, unfollowing, or direct messaging other accounts. Her junior in the ministry, Rajyavardhan Rathore, compared the act to doping in sports. "In sports, this would come under 'Doping'... hey wait!?? Does 'dope' remind you of someone," he said in a tweet. Divya Spandana, who heads the Social Media and Digital Communications wing of the Congress, hit back at Ms Irani and termed the news story as "factually wrong". "Why do we need them when we have you?" she said in response to Ms Irani's tweet. Rajeev Chandrasekhar, a Rajya Sabha MP who is part of NDA, also took potshots at Mr Gandhi. "Desperate times call for desperate measures," he tweeted. Amit Malviya, in-charge of BJP's national Information & Technology, targeted Mr Gandhi in a series of tweets. "Rahul Gandhi should have known that popularity can't be bought, certainly not from Russia, Kazakhstan. Congress' social media dream aborted?" "Insincere politician that Rahul Gandhi is, he wanted to hoodwink people that he is getting popular by deploying bots!" "In their desperation to crown Rahul Gandhi, Congress bought him some love from Russia too!" He also hit out at Divya Spandana. "Congress social media head was on a PR overdrive on how she re-launched Rahul Gandhi.. She deployed fake bots!"